It's time to grab your snacks and all of your comfy gear to sit back and relax with Cineworld. This fantastic venue has been broadcasting blockbusters and all of the most sought after films, to the public since 1995. Now with a number of screening locations conveniently dotted around the UK - you'll never be too far from seeing that film that you've been waiting for. With multiplex cinemas that are filled with IMAX screens, 4DX screens, SuperScreens and more - these guys are leading the path in digital and 3D cinema. Whatever kind of film experience you love, Cineworld can take you there. With options to suit the whole family, seniors, students and more - you can even get that VIP treatment you've been dreaming of when you stick with Cineworld. Here it's easy to be a part of the action for less, take advantage of an Unlimited Cineworld card and you'll be joining hundreds of customers who are enjoying limitless amounts of movies, whenever the moment takes them! For a birthday, a Wednesday, weekend or other - there's always a perfect time to head on to your closest Cineworld. How do I use my Cineworld vouchers? Any other discounts will be automatically applied to your order total so you can continue to checkout securely. You can choose from a range of ways to gift fantastic films in cinema viewing with Cineworld. Choose from a classic gift card, e-gifts and more online. Can I hire a cinema screen? People who would like to book a cinema space for conferences, school trips, parties, faith groups and more can do so at Cineworld. Is there a Cineworld 2 for 1 offer? There is a 2 for 1 offer on with Meerkat Movies, do check the Terms & Conditions, there will also be plenty of deals to browse online on the ‘Offers & competitions’ tab. Does Cineworld do Student Discount? There are plenty of different ticket categories at Cineworld, for students, children, senior citizens and more. Simply bring in your NUS card or local college ID for a reduced rate if you are currently a student. You can also seek out help for specific questions, or ask a question, on the Cineworld help page. With cinemas located all around the UK, including in all major cities, you are bound to find a Cineworld cinema near you. For every film lover, whether you go on the regular or once in a blue moon, with the Cineworld vouchers from us, you’ll be able to get that ultimate cinema experience at a great price. Now you can save on seeing blockbusters, independent flicks and more in every genre - broaden your cinematic senses with vouchercloud. 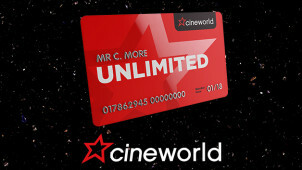 Cineworld has an incredible loyalty card call 'Unlimited' which, like the name, let's you see an unlimited amount of films for a fantastic monthly payment or simple one-off fee. This is every film buff's ticket to a world of limitless enjoyment when you can watch films back to back, over and over again, at your own ease all year long. You could even buy this as a gift, this is a real no-brainer for every blockbuster fiend. For movies that you can want to feel and truly be a part of - an IMAX movie can take you there. For earth-shattering sound, mind-blowing images and giant curved screens to give you an all round incredible experience - book your tickets for less with a Cineworld discount code from us. We are huge fans of the high definition and powerful sound; now everyone can enjoy their favourite films and all of the latest blockbusters even more and for less.